This is a beautifully sweet and spicy dish. The ingredients list is quite long, but don't let that put you off. The result is a beautiful combination of flavours and a fresh, delicious salad with a twist. Make a batter by mixing the gram flour, water and salt, making sure it is not too runny. Dip the paneer cubes in the batter and deepfry them in batches until they are nice and golden. This should only take 4-5 minutes. Mix the peaches together with olive oil, salt and pepper and grill them for a few minutes. Now make the marinade by mixing all the remaining ingredients in a bowl. 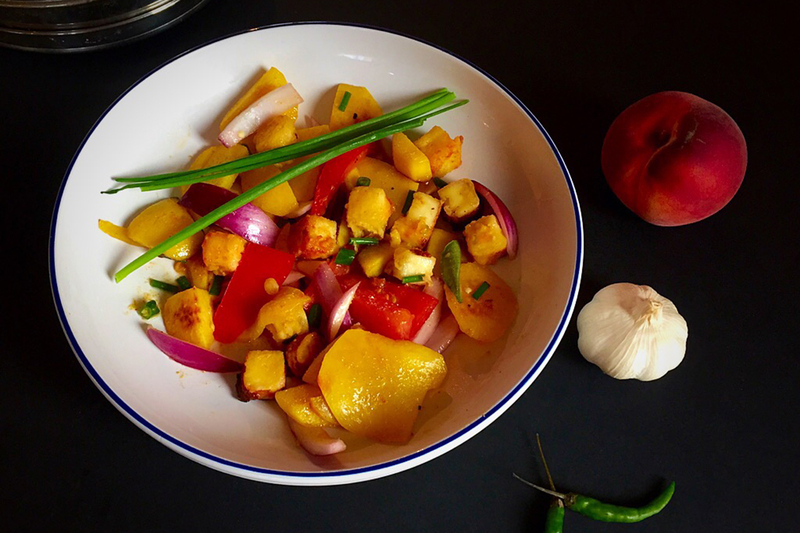 Chop the tomato, chives and onion and arrange the peaches, paneer and chopped vegetables on a plate. Drizzle over the marinade and you have a lovely sweet and spicy dish to enjoy on a summer’s evening. This exotic salad can be cooked up on a fantastic appliance from Leisure. Choose from one of our great range cookers, not sure what fuel type you need? Choose from electric range cookers, gas range cookers and dual fuel range cookers.